In this article, we present you the various talents and glyphs that can be useful for Elemental Shamans (WoW 4.3). We also give you pointers for customising your talent tree and adapting it to particular bosses. The other articles of our Elemental Shaman guide can be accessed from the table of contents on the left. 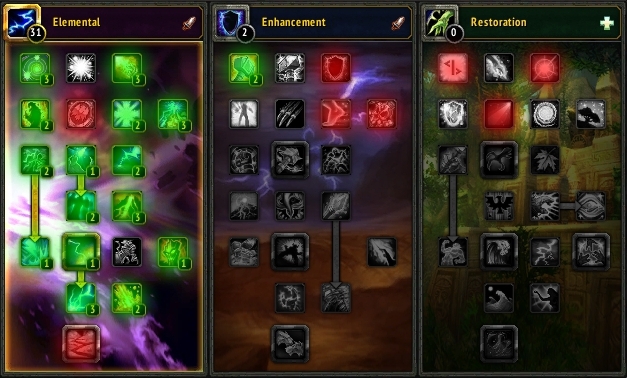 The following talent build is almost standard for Elemental Shamans. It takes most of the necessary DPS talents, as well as the most useful of the utility talents. You will want to use it (or a variation of it, as we explain in the next section) in most cases. This talent build sacrifices mobility for a small DPS boost. 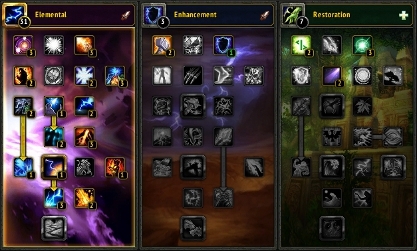 It replaces Ancestral Swiftness in the Enhancement Tree with Totemic Focus in the Restoration Tree. Totemic Focus increases the duration of your Fire Elemental Totem. Elemental Shamans have a few choices for customising their build. In each of the two common builds we gave above, there are a few talent points that can be freely invested. Some of the glyphs are also optional. Even if there are quite a few optional talents, things are much simpler than they appear. First, you should decide whether you want to go for Ancestral Swiftness (for mobility) or for Totemic Focus (for a small DPS boost). If you only play Elemental, you can have two Elemental specs, one with Ancestral Swiftness and one with Totemic Focus. 1/3, 2/3, or 3/3 in Elemental Warding: this gives you a useful damage reduction. 1/1 Earthquake: this grants you the Earthquake ability, which is only useful in AoE fights where enemies are going to remain in the same position for the 10 seconds that Earthquake lasts. Even in fights where you can use Earthquake, you will obtain roughly the same results whether you use Earthquake or not. 1/2 or 2/2 in Totemic Reach: this increases the range of your totems and can be useful in fights where you frequently have to move to deal with adds before going back on the boss. 1/2 or 2/2 in Ancestral Resolve: this reduces the damage you take while casting. Depending on the fight configuration, this talent can be more valuable than Elemental Warding (if the damage is mostly of Physical nature). 1/3 in Improved Shields for a small damage boost to your Lightning Shield. Choosing the correct glyphs as an Elemental Shaman is not straightforward. There are several viable options for your choices of Prime and Major Glyphs. Glyph of Lava Burst, which increases the damage of Lava Burst, your most damaging ability. if you have to move a lot, then use Glyph of Unleashed Lightning, which enables you to cast Lightning Bolt while moving. The only mandatory Major Glyph is Glyph of Lightning Shield, which saves you from having to refresh your Lightning Shield. Glyph of Healing Stream Totem, which can be useful if your raid is lacking classes that can provide Fire, Frost, or Nature resistance. Glyph of Thunderstorm, which increases the mana return from Thunderstorm but removes the crowd control capabilities of the spell (which is not necessarily a bad thing if the enemies you are attacking are not supposed to be slowed down or knocked back). The first two glyphs save you from carrying reagents with you.